Growing up in Perth, Australia, Shane Osborn fell in love with being in the kitchen by tagging along on his mum’s catering jobs. After quitting school at 15, Osborn trained under some of the best chefs in Perth before embarking on an international career that took him to London and Sweden — and earned him numerous Michelin stars along the way, including at his Hong Kong restaurant, Arcane. Most recently, he teamed up with friend and fellow chef Mark Best to compete on Netflix’s “The Final Table. He sat down to talk to The Loop HK about cooking, traveling the world, and the pressures of being on camera. Through my mum. My mum was a caterer and at the weekends I used to go with her to the catering jobs. I was earning money, and I just liked being in the kitchen. I loved the atmosphere, the smells, the sounds the tastes, everything. I did home economics at school, and work experience as a 15 year old, and then just walked into a professional kitchen and knew straight away that’s what I wanted to do. So I quit school, and didn’t go back to finish high school after the work experience. What did you pick up from going on catering jobs with your mum? It would probably just be the enjoyment of being in the kitchen. The buzz of working in a team. You see my guys over there [looks over to Arcane’s open kitchen] they’re all happy, smiling and they love their job. And I’ve always wanted to have that environment. Because we work long hours. It’s not an easy industry, but it should be enjoyable. When I would walk into my mum’s catering kitchens it was all these ladies, about 40 years old, and they were all having a great time, singing along, cooking. It was just great to be part of that. Produce. A great dish is all about the produce. If you buy the best piece of fish, you season it right and cook it right, you don’t need to do anything else to it….maybe add a squeeze of lemon. It doesn’t need shavings on the top of it, or the flowers, the foams, the gels and all that. Just simplicity is the key. Game. I love game. Especially when you’re coming into autumn and winter, and you’re getting all the wild birds, I love rabbits, hares, grouse, venison. Things like that. It’s what I really like cooking. It’s my favorite time of the year. You couldn’t eat fish or shellfish for about 14 years. How difficult for that for your cooking? It was very hard, especially the first few years when my allergies were really high. I was also allergic to porcini, cip, frog’s legs, sesame seeds, everything that I was cooking at the time, I was becoming allergic to, so I had to eat a really simple diet. It was really bad, I had to wear gloves! And my kitchen in London was in the basement so everyday my neck would be swollen and red, and my eyes would be red because you’re in a basement kitchen so the volatile smells of the fish would always make me sick. I was very sensitive to it. And then over time, my body repaired itself, but it wasn’t until I left London and took that year off and then moved to Hong Kong that I started to get a lot better. But it wasn’t until I went to LA, about three months before I went to shoot [The Final Table] that I had a full blood test to see where my allergies were, and they came back saying I wasn’t allergic to fish anymore. You’re originally from Perth – how does that influence your cooking? Well, Australia’s a country without a real food culture of its own, so we absorb everything…Vietnamese, Lebanese…That makes Australians more open to new ideas and receiving different flavor combinations, and I think that’s really helped me through my career. My food is French bias, but there’s a lot of flavors. There are Indian spices, there’s Thai and Vietnamese fish sauces…there’s small subtle flavors from all over the world. So I think that’s what Australians do very, very well. You know before it was seen as ‘fusion’ in the 80s and 90s, which was a dirty word, but now it’s what everybody’s cooking. Why did you decide to leave Perth for London? Well you know, I was 20 years old — and this is the late 80s early 90s — and I felt like I wanted a bigger challenge. 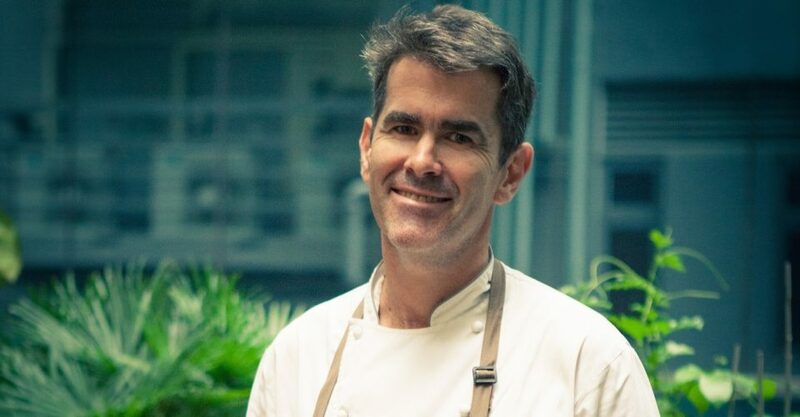 You know Perth, culinarily, wasn’t setting the world on fire, and a lot of the chefs I’d worked for were either from the UK or Europe, and they were nudging me, telling me if you want to achieve, if you want to perform at the highest level, you have to go to Europe. You spent time cooking in Perth, London and Gothenburg [Sweden] before coming to Hong Kong. What did you learn from these global experiences? Well London was all about technique, you know, working as a commis chef and working my way up through the ranks and then becoming the chef and owner of Pied a Terre and getting my one star and two stars [Michelin stars] that really cemented my career internationally. Sweden was great because it opened my eyes to a different style of cooking. A lot of pickling and marinating and stuff that you see now, the Nordic style of food, I was exposed to that at the age of 23, 24, 25, so that’s always been at the back of my repertoire. And then you know coming to Hong Kong there’s been influences here, Asian influences and ingredients that I haven’t used before. So here [at Arcane] we use a lot of Japanese produce as possible because Japan’s just around the corner. So we use a lot of fish, a lot of fruit and vegetables from Japan. Your London restaurant, Pied a Terre, had two Michelin stars for eight consecutive years. What do you think helped you accomplish this? Just hard work. I never set out to get stars. I kind of fell into that job and I’m very happy and proud. It was a great moment to achieve that, but Michelin stars aren’t the be all and end all of the industry. For me it’s about having a successful business and for me that means you’re full every day, and you have great customers and a really great team behind you. I mean if the stars are there then that’s great, but if they’re not, it’s not the reason I do my job. But it was a great accolade to win. You decided to sell up and leave Pied a Terre and take a one-year trip around the world with your family. Why? I’d put so much into my career and made myself very ill through the food allergies and the stress of running a business. I pushed myself extremely hard for 13 years. My wife and I just love travelling and we just thought before we do the next business, let’s take a year together with the kids – they were six and four at the time – and let’s travel. We said screw this, let’s sell the house, sell the business and we just travelled for a year! We just got out a map and said right where do you want to go, we just marked off a lot of the places we wanted to go to. We did probably about 60 70 percent of those. We didn’t get to India or Japan, but we did a lot of Africa, most of south America Australia New Zealand. Most of the US. It was pretty good. Did you find that really inspiring? It was. It wasn’t a food-led holiday, it was more about us as a family and traveling and having experiences, but on the way you pick up food experiences and it kind of made me think about where I wanted to take my career after being at Pied a Terre which was a high end place with all the trimmings. Over time, I just thought, I don’t want to go down that route anymore. Why come to Hong Kong? I’m still trying to figure that one out! But really, we wanted to move to Asia. We wanted a change of scenery and we hadn’t lived in Asia before. It’s got a lot of growth, a lot of potential. Hong Kong’s such a food city and I needed to be somewhere where people are obsessed with food, and this is definitely the right city for that. We actually had a lot of Hong Kong clients at Pied a Terre, so it was a natural fit. I had the feeling that in moving here, people would understand what I was trying to do. Do you feel there’s a difference in what it takes to earn a Michelin star in Hong Kong or London, or to earn one or two stars? Hong Kong Michelin is very different to European Michelin, I feel, in terms of standards. I’m just generalizing, but I don’t think they’re on a similar level. They’re different. The step between one and two stars is massive, it’s a very big jump. We’re [Arcane] a solid one star, we’re not a two star, and I don’t have any ambitions to achieve two stars. We are what we are. We’re a successful business, we do very well, so I’m very happy to sit on one star. I don’t want to reach that level and have people’s expectations, because as soon as you go to two or three stars, people’s expectations are too high and they compare you with other two or three star restaurants. We’re a small compact dining room, and we’re not a two star establishment. What challenges have you found with cooking and running a restaurant in Hong Kong? The number one challenge is the rent. You know, as a chef and business owner, the rents are just way, way too high. It’s really difficult to make a profit when the landlords are charging such high rents on very short leases. Staffing can be an issue – not just in Hong Kong but in the industry – but I’m very lucky I’ve got a loyal staff, we treat them well and look after them so we’ve never had an issue with staff since we opened four years ago. And produce. It’s hard to get good produce in Hong Kong because nothing is grown locally – or at least not enough, and to at the quality we need. Shane Osborn [right] and Mark Best on set on “The Final Table”. 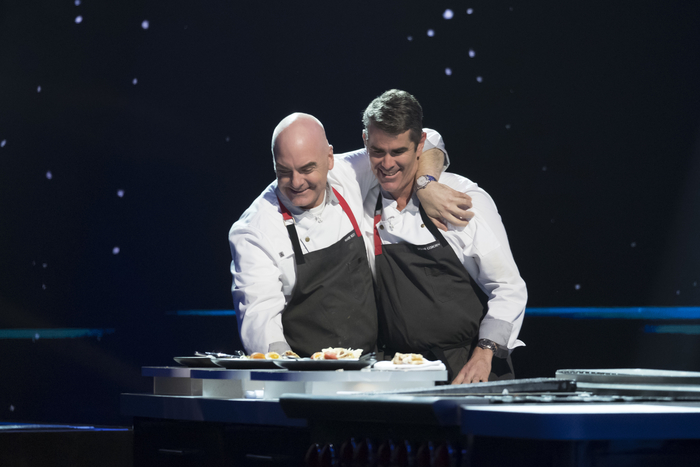 You and Mark [Best] made a great team on “The Final Table.” Had you cooked together before? We had an absolute ball! On camera and off camera, we were just being ourselves, and we click very well, we’ve got a very similar sense of humor, we like similar music. But we’ve never been in a kitchen together before. But the experience was brilliant. Our communication from day one was great. We had a conversation about this, and every challenge we divided up tasks and just communicated all the way through. It’s super high pressure, and it’s really hard, – the show’s the hardest thing we’ve done. To cook in an hour those dishes at that level was very hard. So we only did well because we were able to communicate and had a very clear goal of what we wanted to achieve. You guys also looked like you were having fun! Even though you wanted to win, you were just enjoying being along for the ride. Was this the case? Mark and I love this industry and we love the people involved, and we wanted to project a very positive side of the industry. Being a chef, one of the things people always say to me is “oh it’s such a hard job.” But it’s not all like that. There are good people to work for in the industry and I want to promote that because it is the best industry in the world if you work for the right people. So we went in there wanting to show the humility and the good side of being a chef. We had the dad jokes and we loved it! We had fun, and we do that in my kitchen every day, we take the piss out of each other and it’s banter. But it’s respectful banter, and I think that’s one thing that comes across on the show, the respect that everybody has for each other. We all come from very different backgrounds, but we all have this commonality of loving our jobs and loving the industry. On “The Final Table,” how did you manage to come up with the concepts and executive these complex dishes in one hour? People have asked me if I can recreate those dishes and…I mean it was almost a traumatic experience to go through, and at the end of every challenge when they were counting down, I was like, can we not have five more minutes?! You’re cooking in an alien kitchen that you’re not used to. The first couple of episodes were really difficult because you don’t know where the equipment is, you don’t know how the gas works, it’s not your normal environment. So that added to the pressure. And then there’s 20 cameras and producers talking to you — you’re mic’ed up, so if you make a mistake, the cameras are straight onto you and you’re being asked “what happened there Shane, did you make a mistake?” So you had all this pressure, you had to perform, cook, talk all at the same time…it was a real pressure cooker environment, but I think we did pretty well! Because each episode featured a different country, you had to cook dishes and cuisines that you weren’t necessarily that familiar or comfortable with. How did you cope? Was there one that you felt you were particularly out of your depth with? Japan. I mean Kaiseki. Each challenge, we had to understand the feeling, the history behind the dish, and what makes it so special for the country. Because the judges were sports stars, musicians…there was usually a critic but these are everyday people and this is their national dish, and you have to pay respect to that. So we tried to understand the philosophy behind the dish and respect that. But the Japanese one was really hard. I mean I love and respect Japanese cuisine and culture to the highest, for me it’s the best country in the world for that, so to pay respect to that and follow the ethos behind Kaiseki was really difficult, respecting flow in the story… and we only had 70 minutes to do that…it was just so hard! In the finale, the judges criticized your dish for being rather too simple. Is simplicity a bad thing though? No, it’s not! I mean, I knew I was going to be up for criticism and even while we were filming, the producers were like, “do you not think you should do something a little more complicated?” And I could have. I could have done something extremely technical, and I had planned to do it. But then I thought, actually, I want to show the style of food we do at Arcane. It’s the food I think is right for now. It’s super simple. It’s scallops – it’s one of my favorite ingredients. I can eat them now after not being able to eat them for 14 years, and it was a simple dish, and it’s something that we will have on at Arcane at some point. If I’d done another dish, it would’ve felt like I was cheating, because that’s not what I believe in anymore. I don’t like cooking that style anymore. So this reflects on the style of cooking I do at Arcane. In fact some of their dishes [the celebrity chef judges] are very simple, I mean they cook their dishes to show their style and some of them are extremely simple! So how can you criticize someone for not pushing the boat out? Some of the best dishes I’ve ever had in my life have been three or four ingredients on a plate and that’s it. Everyone wants to know – when are you and Mark opening The Ghee Spot? [Editor’s note: On “The Final Table,” Shane and Mark did well in the Indian cooking challenge and later joked about opening a restaurant called The Ghee Spot. ]Well we’re [Shane and all the other Final Table chefs]are looking at doing collaborative dinners and events together. But Mark and I really want to do The Ghee Spot pop-up, so we’re working on that at the moment. We’d like to do one in Hong Kong and then perhaps take it to India and to go to the US…we’ve had hundreds of request! And we want to make it really hard to find so it’ll be a great laugh and a really good event. Well The Ghee Spot is definitely one of the things that’s next. I’m also opening a new place, Cornerstone, soon, so I’m doing some work around that. [Editor’s Note: Cornerstone is slated to open in the next few months].